Acute liver injury (ALI) is a major reason for stopping drug development or removing drugs from the market. Hospitalisation for ALI is relatively rare for marketed drugs, justifying studies in large-scale databases such as the nationwide Système National des Données de Santé (SNDS), which covers 99% of the French population. SNDS was queried over 2010–2014 for all hospital admissions for acute toxic liver injuries not associated with a possible other cause, using a case–population approach. Exposures of interest were drugs dispensed from 7 to 60 days before date of admission. Individual drugs were analysed by their frequency (if five or more cases) and by the ratio of exposed cases to the number of exposed subjects and to exposed patient-time in the general population over the same timeframe. Over 5 years, 4807 cases of ALI were identified, mean age 54.5, 59% women, 76% exposed to at least one of 249 different drugs. Drugs most commonly identified were non-overdose paracetamol (31% of cases), esomeprazole or omeprazole (18%), phloroglucinol, domperidone, co-amoxiclav, furosemide, and atorvastatin (more than 250 cases each). When compared to population exposures, the highest per-person risks were observed with antimycobacterial antibiotics, with one case for 1000 or fewer users, followed by colestyramine and erythromycin (around 1/5300), antiepileptic drugs, anticoagulants, and anti-Alzheimer drugs (1/6000–1/10,000 users). When a person-time approach was considered, the drugs with the highest per-tablet risk were still the antituberculosis drugs, followed by a number of other antibiotics. This nationwide study describes drugs associated with ALI, according to absolute population burden and per-patient and per-tablet risk. Some of these associations may be spurious, others causal, and others yet were unexpected. Systematic analysis of drug classes will look for outliers within each class that could raise signals of unexpected hepatic toxicity. The authors wish to thank ADERA, the non-profit organisation that provides legal, administrative and human resources support to Bordeaux PharmacoEpi. The present paper is a product of the EPIHAM Project that was submitted for public funding by the Bordeaux PharmacoEpi research team and served as support for the Eu2P PhD project of Prof. Sinem Ezgi Gulmez. Prof. Nicholas Moore had the original idea and supervised the project. Cécile Droz-Perroteau was the chief operating officer, discussed the study background, and coordinated study logistics. Adeline Grolleau was the operational study manager and collaborated to draft the manuscript. Régis Lassalle was the chief statistician and data manager. Vanessa Barbet and Mai Duong provided data management and statistical analyses. Nicolas Thurin is a scientific adviser, and he contributed to the selection algorithm of the cases. Stéphanie Duret developed this specific analysis and collaborated on the draft of the manuscript. All authors contributed comments and approved the final version of this paper. Nicholas Moore, Stéphanie Duret, Adeline Grolleau, Régis Lassalle, Vanessa Barbet, Mai Duong, Nicolas Thurin, Cécile Droz-Perroteau, and Sinem Ezgi Gulmez have no conflicts of interest that are directly relevant to the content of this study. All authors have completed the Unified Competing Interest form at http://www.icmje.org/coi_disclosure.pdf (available on request from the corresponding author) and declare no support from any organisation for the submitted work and no other relationships or activities that could appear to have influenced the submitted work. Bordeaux PharmacoEpi receives funding from various pharmaceutical companies and governmental bodies to conduct research on marketed drugs at the request of regulatory authorities or as a consequence of research grant applications. None of these concern the subject at hand. This study was supported by an unconditional public joint grant from Direction Générale de la Santé (DGS), from Mission recherche de la Direction de la recherche, des etudes, de l’évaluation et des statistiques (MiRe-DREES) of Caisse Nationale d’Assurance Maladie des Travailleurs Salariés (CNAMTS), Régime Social Indépendants (RSI) and Caisse Nationale de Solidarité́ pour l’Autonomie (CNSA), as part of the general call for projects by IReSP (Appel à Projets, Institut de Recherche en Santé Publique), no. 2013-29. It was designed, conducted and analysed independently by the Bordeaux PharmacoEpi Research Platform, CIC Bordeaux CIC1401. In accordance with the French regulations, this study received authorisation from the Institute of Health Data (Institut des Données de Santé) and from the French Data Protection Commission (Commission Nationale de l’Informatique et des Libertés). 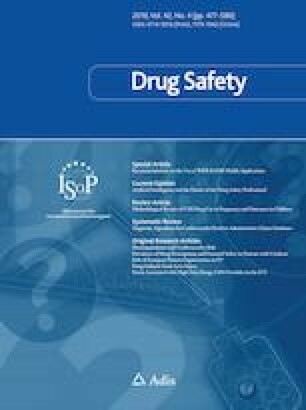 This study was registered with ENCePP (http://www.encepp.eu), at the European Medicines Agency (EMA, London, UK), with the registration number ENCEPP/SDPP/7549.